As CoPilot: With Capt John R. Johnston (P) - Four missions (83 - 26 Nov 1944, 86, 88 and 89 - 16 Dec 1943): With 1Lt Arnold S. Litman (P) - Eleven missions (91 - 22 Dec 1943), 94, 95, 97, 99, 100, 102, 103, 104, 105, 198 - 11 Feb 1944). As First Pilot - Fifteen missions (109 - 20 Feb 1944, 110, 113, 114, 115, 121, 122, 123, 124, 125, 126, 129, 130, 132, 133 - 10 Apr 1944). Lt Carroll Binder, Jr (N) - Flew seven missions with Lt Gorman (P) - Mission 109 (20 Feb 1944), #110,113,114,115,122,132,133. Flew additional missions with other Pilots. Killed in Action mission #159 24 May 1944 to Berlin, Germany with the 1Lt J.E. Worthley Crew. B-17 #42-97787 (No name) ditched in the North Sea (9 KIA & 1 POW). Lt Elmer P. Israelson (B) - Flew seven missions with Lt Gorman (P) and others with Lt Hofmann (P) including mission #140 (24 April 1944) when the Hofmann Crew was interned in Switzerland. Escaped from internment in Switzerland. Was dispatched on 25 combat missions. T/Sgt William R. Blakeney, Jr. (E), T/Sgt Seymour Berman (R). Sgt Ollie G. Crenshaw (BTG) - Flew six missions with Lt. Gorman (#109,110,113,114, 115 & 122) Became member of the Lt Hofmann Crew on mission #121 (16 March 1944 and flew 15 mission with Lt Hofmann. Interned in Switzerland on mission #140 (21 April 1944). Sgt James O. Williams (RWG) - Flew two missions with Lt Gorman (#115 & 122) and five missions with Lt Hofmann. Was Killed in action on mission #126 (23 March 1944) to Hamm, Germany flying as Tail Gunner, Lt Hofmann (Pilot), in B-17 #42-32037 Betty Jane. A flak hit knocked out the entire Tail Gunner compartment. His body was recovered in Hamm, Germany on the next day. 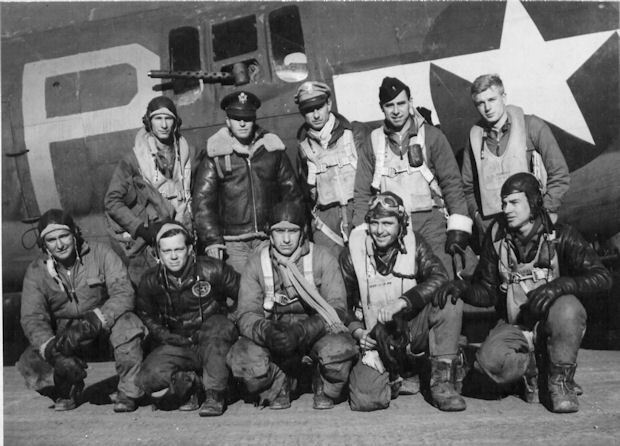 Sgt James B. Galloway (LWG) and Sgt Bob Jensen (TG) - Flew four missions with Lt Gorman (P) (#109, 113,114,115 ) and four with Lt Hofmann (P) (#121, 122, 123 & 124 - Jensen only) and five missions with other Pilots - Total of 13 credited missions. Lt Gorman flew with substitute crewmen on many of his missions after his CoPilot Lt Hofmann was upgraded to Pilot. Lt Gorman was the only member of his crew to complete their combat tours of 30 missions. There was a loud knock on our door, and it was opened noisily. A moment later the lights were napped on and four sleepy combat men were blinking at a harassed looking corporal in the doorway. We knew what his mission was -- I, at least, had been lying awake for over an hour, worrying about the day ahead as I used to do before an exam at Harvard . . . continued . . .